Not only is the male golden eagle (Aquila chrysaetos) an impressive looking bird, he really knows how to impress a female. His mating behaviors include sky dancing, in which he engages in numerous steep dives and other aerial feats. 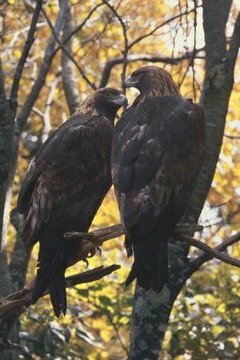 Golden eagles mate year round, so their courtship rituals might be observed at any time. They begin breeding at about the age of 5 years. Up, up and away -- the courtship rituals of mated eagles include lots of flying. It's an aerial courtship dance, which includes a series of intricate swoops and dives. The male and female might also soar in unison, with the male then streaking ahead and diving back toward his mate. She turns her back on him, then "presents her talons to his," according to the Oregon Zoo website. Courtship flying also includes mock attacks and chasing. 'Til Death Do They Part? Most, but not all, golden eagles mate for life. Even if they aren't lifelong mates, pairs generally stay together for several years and are monogamous for that period. However, if one of the eagles dies the survivor will seek out another mate. Eagle pairs don't just create homes and raise young together, but also hunt for food. A pair might hunt rabbits cooperatively, with one keeping the prey's attention while the other swoops in for the kill. Nest building is part of the bird's mating behavior. Nests are generally constructed on trees or cliffs, near the eagle's hunting areas. Golden eagles like to have a good, panoramic view of their territory from the nest site. The pair share in nest-building, constructing their large home from thick branches and vegetation. A mated pair might use the nest year after year, repairing and maintaining it during that period. The average golden eagle nest ranges between 5 to 6 feet wide and 2 feet high. Eagles might copulate all year, but do so most intensely prior to annual egg laying. The female usually lays two or three eggs, although she might just produce one or up to four. Eggs are produced every other day and don't hatch at the same time. She sits on the eggs -- occasionally spelled by her mate -- for about 45 days. Once the eggs hatch, the female stays with them constantly for the next 10 days, with the male providing food for his mate and brood. Only the female actually feeds the young. It can take up to six months before the young become fully independent from the parents and leave the nest.